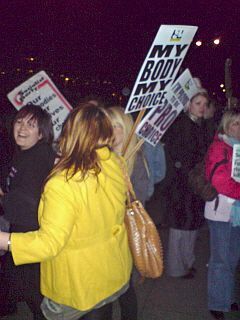 There were over a hundred of us in attendance at the pro-choice demo outside City Temple last night. Aside from the heavy-handed arrest of a well-known Cardiff anarchist that resulted in a bunch of us picketing the police station later on, there were no problems. Indeed, I went fully prepared for verbal abuse from some of the talk attendees as they went in to see the “Passion for Life” talks but the man who barked “shame on you!” and the woman who informed a demonstrator “it’s not your body, it’s God’s” were the worst I saw (i.e pretty tame stuff). I have to admit I did wonder if any of the “Passion for Life” attendees were actually pro-choice and simply informing themselves on “pro-life” politics. However, the rather hostile expressions and lack of eye contact as they went in suggested this was largely not the case. Then again, perhaps any quiet pro-choice supporters going in didn’t want the police who were guarding the door to clock them? They might have refused to let them in! Ironically, a smartly dressed comrade, who was able to slip into the meeting, told us on our returning coach that Anne Widdecombe hadn’t turned up and that it was a very dour affair that lacked the passion of the demo going on outside (which, happily, could be clearly heard inside the meeting). My only slight regret of the evening was that I didn’t get to hear the anti-abortionist who demanded the megaphone. While I could understand why he wasn’t given it, I think the reminder of what we’re up against would have been very motivating. Thank you so much for coming to picket Passion For Life. Abortion Rights is not here to try to stop this meeting, or to intimidate the attendees. We don’t want to infringe on their right to hold the view that every sperm is sacred, or to stifle their freedom of speech in any way. If fact, I’m really interested in what they’ve got to say. Which is why I attended one of their meetings earlier in the tour. Now I know very well that there is a wide range of views on abortion, I work very hard to defend freedom of individual choice and opinion on the subject, whatever the position. I have never met anyone who was “pro-abortion”! We are not here because we think abortion is right, or think that it’s a good thing for a woman to have to go through. We don’t like pregnancies having to end in this way. Being pro-choice isn’t about promoting abortion or judging whether abortion is right or wrong, it is about giving women freedom to decide for themselves. It is about fighting for the right of women to make their own decisions, even if they are different from your own. This misrepresentation of reproductive rights is not going to work! We know that the rights of women are more important than the rights of unwanted pregnancies. 1 in 3 women in England and Wales will have an abortion at some point in their lives. Many people here will have had to consider an abortion, many of our friends, our girlfriends, our sisters have been through this, and we have held their hands. So we know that the decision is difficult, and women take that decision very seriously and are not naïve, immoral or lazy. This demonising of women is not going to work on us! We refuse to accept these unfair and controlling ideas about women. We’re the largest democratic group of disabled people in the UK and, year on year; disabled people have made it clear that they don’t want to interfere with a woman’s right to choose. It’s actually very offensive that disabled people are being used as a political tool in order to bash women’s rights. No one should be forced to have any form of medical treatment against their will, invasive or otherwise, and that includes being forced to go through a pregnancy, against your will. This exploitation of people with disability to undermine abortion rights is not going to work! We defend a woman’s right to choose whether or not the fetus shows signs of impairment. This is an out and out lie! Late last year the Commons was presented with a very substantial report from the Science and Technology committee. It over-whelming supported a liberalisation of the abortion law. The RCOG, BMA, RCN, FPA, BPAS, MSI and 2/3 of the British public all support a change in the law to end the need for two doctors permission to get an abortion. The UK is lagging behind the rest of the developed world by not affording women abortion on request. The only other medical procedure that needs the consent of two doctors is the mental health section! In there they will be claiming that the 24 week limit is wrong and that there is scientific proof that it should be reduced. Well the charity Antenatal Results and Choices, RCOG, MRC, RCN, BMA, British Association of Perinatal Medicine, MSI, FPA and Brook all support the time limit staying at 24 weeks. There is no significant scientific evidence that it should be reduced. Not in terms of infant viability, not in terms of fetal pain experience. This is the truth. Our view is the majority view. It is backed up in fact and motivated by a desire to let people make their own choices on abortion. It is time the majority view and the medical profession was properly represented by our politicians. This year demand that your MP supports positive amendments to the Abortion Act! Send them this card. Demand the right to abortion on request. Defend the 24 week limit. Photograph originally from the Cardiff Permanent Revolution website. The fact that I wasn’t able to go last night is driving me to drink. Thanks for all these reports on the demos, really good to hear the pro-choice majority’s strong voice. Well done to all in Cardiff for what sounds like quite a succesful demo! Just want to thank all the activists who came over from Bristol and helped make the event such an unqualified success. Let’s keep up the connection.